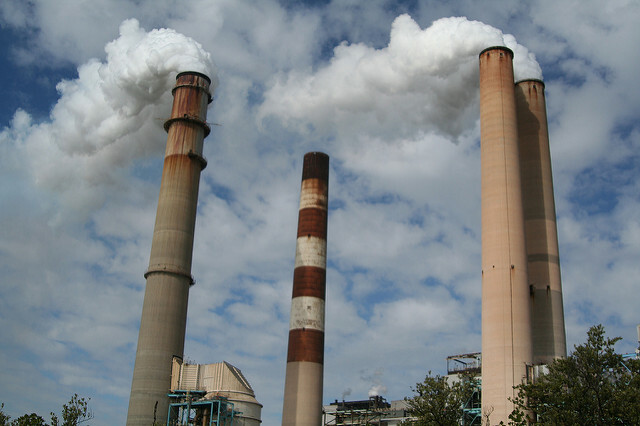 On December 28, 2018, the Trump administration announced that the Mercury and Air Toxic Standards (MATS) that restrict mercury emissions were too costly and without enough benefits to make them necessary. Those in favor of the restrictions argue that the real cost comes from changing the standards. Why is mercury an issue? Mercury is a heavy metal that is released into the atmosphere from a variety of sources, with coal burning power plants being one fo the primary sources. Once mercury is released into the air, rain and snow send it to the waterways, where it converts to the toxic methyl mercury. From there, it contaminates the water we drink and begins to work its way up the food chain beginning with smaller fish and accumulating at higher amounts in larger fish, such as salmon or tuna exposing humans to further risk. The debate about the restrictions e. centered around the cost-benefit analysis of MATS, and specifically around what should be considered a co-benefit. The original analysis issued by the EPA in 2011 factored in the co-benefits [JG1] of reducing particulate matter (PM) as well as the direct benefit from cutting back on hazardous air pollutant (HAP) emissions. In this analysis, the projected health savings were $59 billion to $140 billion annually. This more than offset the estimated $10.9 billion annual cost of regulating emissions. In 2018, though, the Environmental Protection Agency (EPA) produced a Supplemental Cost Finding proposing that including co-benefits related to PM is flawed, and the analysis should only consider quantifiable benefits from HAP reductions. Using this revised approach, the health-related co-benefits would only be $4 to $6 million annually. Compared to the billions needed to enact the regulations, the new finding claims that it is not “appropriate or necessary” to regulate emissions, since it’s not cost-effective. The proposal also indicates that while there are other benefits, they are unquantified and not enough to support the stricter standards. One of the surprises of the revised analysis is the timing. When MATS was passed, facilities had up to 5 years to meet the standards. This means that the majority have already paid to install the necessary technology to reduce emissions. Changing the standards now won’t give them that money back. On the other hand, many utilities are already recouping their investment through regulated pricing. This has raised some questions about the intent of the supplemental analysis and who would benefit from the change. Power plants are the primary source of most pollutants, and within the power sector, coal-fired plants produce 99% of mercury emissions. They also generate the majority of other pollutants. As a result, they’re the most impacted by MATS. Those coal plants would therefore stand to gain the most. It’s uncertain how helpful this would be, however, given that coal-fired power generation has fallen more than 40% since 2007. Changing the cost-benefit approach could set a dangerous precedent. It could set a new standard the way health benefits are considered for all future standards and environmental rulings. Such a change is significant because of the potential damages. Mercury is a neurotoxin that can damage the brains and nervous systems of unborn babies and young children. As a result, consuming fish with high mercury levels can cause serious harm, especially for children, nursing mothers, and women who are pregnant or might become so. The EPA estimates that each year, more than 300,000 newborns may have a higher percent of learning disabilities due to mercury exposure. Other health impacts can affect all ages and include damage to the brain, heart, kidneys, liver, and immune systems. This can lead to muscle weakness, loss of peripheral vision, lack of coordination, speech impairment, and impaired hearing and walking. What makes the health implications even more worrisome is that mercury is widespread, and it lingers for a long time. A study by the EPA in 2009 found that 48% of lakes and reservoirs nationwide had levels of mercury exceeding the guidelines (0.3 parts per million). Maine is far from immune, since prevailing winds bring mercury emissions from coal-powered plants in the west. The state of Maine already warns people that due to pollutants, they should not have more than two servings of fresh-caught fish per month, depending on where fish are caught. But restrictions on mercury emissions have been making a difference. According to research done by Nicholas Fischer of Stony Brook University in New York, mercury has been decreasing in the Gulf of Maine. This has also led to lower levels of mercury in tuna, declining at the rate of 2% per year. Those gains would likely be lost, though, if the new proposal goes through. Also, while the coal industry might have a reduction in costs, other sectors – such as recreation, education, and employment – could see higher costs. For example, the original cost-benefit analysis pointed to 5.1 million days of restricted activity due to emissions. Those impacted won’t be out skiing, hiking, hunting, or fishing, something that hurts states like Maine who have economies that are dependent upon eco-tourism. The cost impacts on education is another factor. Mercury negatively impacts the brainmdevelopment of young children who are exposed to it; children effected by mercury exposure will need extra care and support in educational settings. According to the National Education Association, a student who needs this sort of assistance can cost $9,369 more to educate than a student who does not need assistance. When these students become adults, their opportunity for employment and earnings will likely be reduced by those early health impacts. Mercury levels also have implications for the fishing industry. Bluefin tuna are only now beginning to make a comeback after conservation efforts. They’ve recovered enough to allow some fishing in the Gulf of Maine, including an 801-pound catch in 2018. Ttheir economic impact is considerable. In 2013, a single bluefin sold for more than $1.75 million at a Japanese auction. Unfortunately, these tuna are also likely to have elevated levels of mercury, especially if emissions increase. If the fish become more dangerous to consume, they’ll be less viable in the Maine economy. Additionally, mercury has a negative health impact directly on fish. Elevated mercury levels can slow growth and development in wildlife and fish, and reduce their rate of reproduction. That doesn’t bode well for an economy that relies heavily on fishing and brought in $616.50 million in 2015. Although the health benefits from reduced emissions are not easily quantifiable, they are still significant and shouldn’t be discounted. It also seems counter-productive to remove standards when the costs of implementing them have already been paid. The Trump administration would do better to leave the standards in place so the people of Maine, and the rest of the country, can enjoy the benefits. This past week, newly elected governor Janet Mills ended former governor Paul LePage’s ban on wind farms in certain areas of the state. As an environmental economist, I am in favor of increased wind power in the state. Renewable energy sources, such as wind, solar, and in certain circumstances, hydropower, will help with our much needed transition away from fossil-fuel based energy.. Furthermore, wind power provides well-paying jobs in construction in primarily rural areas of the state, as well as property taxes, the potential for income for rural landowners, and other tangible benefits to host communities. Do wind farms enhance or detract from tourism? Answer: it depends on the context. Some studies have found that proposed wind farms affect potential demand for tourism, but those studies are hypothetical, not actual. A recent study in Scotland found that there was no correlation between existing windfarms and tourism-related employment. Other case studies have shown that wind farms can actually be a boon to tourism, if local tourism agencies market them as a tourist attraction . More work needs to be done on looking at the effect of actual, operating wind farms on tourism in different contexts. In any case, the concern about conflicts between wind farms and tourism can be mitigated by proper planning and siting. Do wind farms have a significant impact on migratory birds? The answer here depends on what you consider significant, and again, it depends on the context. Wind turbines located in migratory corridors have been linked to avian mortality, and those deaths are increasing as wind power generation itself increases. Still, some studies suggest that wind-power related avian deaths are less than those associated with other forms of energy, and much less than those associated with the average housecat. However, that does not mean we should brush those concerns away lightly. New technologies in turbine and blade design, as well as proper modeling and siting procedures – as well as simply shutting down generation during peak migration – should mitigate this concern. Do wind farms increase or decrease property values or property taxes? Evidence shows that large-scale wind development in residential areas does have a negative impact on homes in direct proximity (much like any other energy-related infrastructure), and that this effect declines as distance to the wind farm increase. However, properties in rural areas that are host to a turbine can see an increase, as the potential for income from the land is realized https://www.cfra.org/news/180719/are-property-values-affected-wind-farms. There also is evidence that the added property tax revenue from a wind farm can reduce a town’s overall mil rate. Again, these concerns can be mitigated by proper planning and siting. Ortega, Francesc and Taṣpınar, Süleyman, 2018. “Rising sea levels and sinking property values: Hurricane Sandy and New York’s housing market,” Journal of Urban Economics, Elsevier, vol. 106(C), pages 81-100. This paper analyzes the effects of Hurricane Sandy on the New York City housing market from 2003-2017. Their results indicate a persistent negative effect among properties within the flood zone that had not been damaged by the storm. In contrast, properties that had been damaged by the storm suffered an immediate negative price effect that was up to three times as great, followed by a gradual convergence to the level of nondamaged properties. The authors conclude that the housing market in New York City has been affected by greater awareness of flood risk following Hurricane Sandy. Journal of Environmental Economics and Management 92 (2018): 418-432. Continuing our property value theme, Tang et al. investigated the influence of mercury pollution on property values, as an implicit value of mercury pollution reduction. They looked at approximately 83,000 property transactions in New York State over a 9-year period. Results demonstrated that property values within one mile of a lake for which an advisory had been issued were 6-7 percent lower than similar properties surrounding a lake for which no such designation had been made. Their results “can serve as a partial indication of the benefits of the Mercury and Air Toxic Standards (MATS), which includes the first mercury emission standard in the United States.” It’s worth noting that the Environmental Protection Agency is currently reviewing a proposal that could undermine the MATS. Yet another article investigates the effects of urban parks on adjacent property values. The authors estimate residents’ willingness to pay for park availability in Copenhagen, Denmark, by investigating the effects of distance to a park and park density on apartment rents. The authors claim: “‘Parks provide recreational opportunities for urban residents and visitors. Urban green spaces furthermore provide climate regulation functions, harbor biodiversity and provide other ecosystem services… However, in the absence of thorough insights into the values of urban green space, the need for such regulation [to provide urban parks] may be neglected whenever new neighborhoods are planned and developed.” One of the interesting things about this paper is that it investigates both proximity to and density of green spaces and finds that both measures are important and capture different components of willingness to pay. The article finds that proximity to green space has a positive effect on apartment rents (meaning that people are willing to pay more to live near a green space, all else being equal), and that there may be a “saturation point” beyond which an additional park does not add significantly to household welfare. Dr. Rachel Bouvier will be the featured presenter at the next Waterfront Alliance Meeting on Tuesday, January 9th. She will be joined by other community members as part of a discussion on the topic: Crafting an Economically Sustainable Working Waterfront. You’ve probably heard about some of the recent changes from the Environmental Protection Agency (EPA). But you might have missed the proposal about particulate matter (PM), since it didn’t get as much press. Or even if you saw it, you might not have recognized all the implications because they’re not immediately obvious. This proposal is to define a safety threshold for what’s called PM 2.5, and it’s a reversal of the EPA’s prior stance. Until recently, the EPA said that no amount of particulate matter can be considered safe. Changing that could have serious impacts on our health – and the economy. What is PM 2.5, and where does it come from? Even if you’ve never heard of particulates, you’re likely familiar with them. These are the fine particles of liquids and solids that contribute to haze-filled cities and poor air quality. In fact, another name for PM is particle pollution. This is because the tiny size allows these particles to get everywhere – including deep in your lungs. PM 2.5 is a specific kind, named because the particles are only 2.5 micrometers in size. For comparison, an average human hair is 75 micrometers in width. 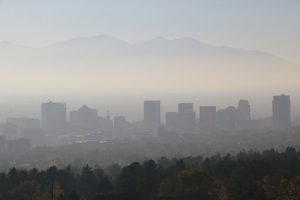 Under the current policy, with no level of particulate matter considered “safe,” any reduction of PM 2.5 below current levels is considered a benefit, and can be included in federal cost-benefit analyses. In other words, if regulations to reduce greenhouse gases simultaneously reduce PM 2.5 (as they would, given that they share many of the same sources), that reduction counts as a co-benefit. And those co-benefits can play a significant role in the cost-benefit analysis of any proposed regulation to reduce greenhouse gases. For example, the Clean Power Plan from the Obama era had an estimated $20 billion in climate benefits. But the benefits go up when you consider that the same technology used to reduce power plant emissions would also cut PM levels. Those changes result in an additional $13 to $30.3 billion in health benefits, effectively doubling the benefits. Similarly, the Mercury and Air Toxics standards save $4 to $6 million by reducing toxins. And in this case, the co-benefit from reducing particulates is even higher, coming in between $37 and $90 billion. Now, under the proposed changes, lowering PM levels below the suggested “safety levels” won’t count as a benefit. After all, if anything below the threshold is already considered safe, bringing it down even further won’t be helpful. This means that moving forward, climate change initiatives like the Clean Power Plan wouldn’t be able to factor in the lower levels of PM 2.5. And without that, the initiative might not get implemented, because the cost would be considered too high without the co-benefit to offset it. The impact on regulations is a concern, but those aren’t the only considerations. Air pollution already causes damages between $75 and $230 billion annually. And PM 2.5 contributes more to that than their size indicates. But the costs also come from lost work time and reduced productivity. People who need to take time off for appointments and medical care won’t be as effective. Similarly, those who can’t breathe as well have less energy and will be less productive, even if they don’t require urgent care. In addition, since particulates contribute to poor air quality, people might be more likely to stay inside. This means lost revenue from outdoor recreation and the potential of reduced health from lower levels of activity. Poor air quality actually could have a negative impact on region’s workforce. Putting a priority on quality of life is becoming more common – including looking at factors like air quality. If an area has a distinct haze, or higher levels of respiratory conditions, people may choose to leave, or to not move there to begin with. While it’s impossible to identify all the effects of the EPA’s proposed safety threshold, it’s clear that the negative impacts could be far-reaching. Given that, the EPA and other agencies should take all of the risks into account before accepting a change that could cause such extensive damages to our environment, our health, and our economy. Here’s something to think about during the next rainstorm: where does all that rainwater go? For most of us, it’s not something to which we give more than a passing thought. But if you’re concerned about saving money and protecting water quality, it’s worth a closer look. In many older New England towns, the infrastructure that conducts sewage from our homes to our wastewater treatment plant is old, crumbling, and not up to today’s needs. During relatively dry times, the system works pretty well. Pipes convey sewage to the sewage treatment plant where it is treated and then released. But during times of intense rainfalls, that excess water running down our streets to our storm drains can overwhelm those older pipes. During those times, the pipes essentially overflow, and raw sewage mixed with stormwater can make it into rivers and oceans. 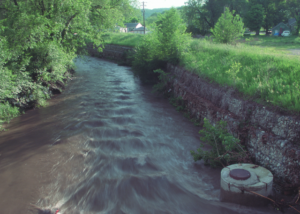 These discharges are called combined sewer overflows, and despite heroic efforts to separate them, they do still exist (see our prior blog posts Money Down the Drain Part 1 and Part 2). Recently in Portland, Maine a heavy rainfall, combined with human error, contributed to a million-plus gallon spill of partially treated sewage directly into Casco Bay. There are several different strategies for a city or municipality attempting to address its stormwater issues. Coming up with those strategies may be a job for an engineer. Prioritizing those strategies, on the other hand, may be a job for an economist: someone who can weigh the costs and the benefits of each, keeping in mind that there may be hidden costs and benefits to each alternative that are not immediately obvious. Determining the financial costs of each strategy is relatively easy. But coming up with the benefit – the return on investment, or bang for your buck – isn’t as straightforward. Stormwater management can bring economic and fiscal benefits in terms of “avoided costs.” By reducing the flow of stormwater that needs to be treated, the municipality saves the money that it would otherwise have needed to treat it. That’s not insubstantial. Treating a gallon of stormwater can cost substantial amounts of money in operations and maintenance costs (think electricity, chemicals, filter replacement, sludge disposal, etc.). Every gallon of runoff that is diverted from the treatment plant is that much money saved. In addition to avoided treatment costs, there are avoided property damage costs. Floods that are caused or exacerbated by excess stormwater (sometimes called “urban flooding”) can cause damage to property. A 2014 study in Cook County, IL, found that chronic and systematic urban flooding had led to property damage claims of over $773 million over a five year period. This number is likely a significant underestimate, as flood insurance only covered a small portion of all damage costs. Less easily measured are the costs of disruption to emergency services like police, fire and ambulance services, and losses to private companies that not only may lose inventory but business as well. The benefits of dealing with stormwater include the avoided costs of treatment, as well as the avoided costs of flood damage, but that’s not all. Other categories of avoided costs include the costs of treating waterborne diseases. Untreated wastewater that flows into our rivers, streams, and oceans can carry with it diseases and pathogens. Treating those diseases in humans has economic costs. A recent study published in the journal Environmental Health estimated that the “economic burden” – defined as both direct treatment costs and indirect opportunity cost, such as lost productivity – of recreational waterborne illness cost the nation upwards of $2.2 – $3.7 billion annually. That’s a lot of money. Moreover, contaminated wastewater that flows into our waters can have a detrimental effect on industries that depend on clean water. For example, a recent study from the University of Maine estimated that the closures of shellfish beds caused by toxic algal blooms linked to pollution from combined sewer overflows led to at least $3.6 million in lost revenue over a nine year period. That amounted to approximately 27.4% of revenue from those beds. Estimating the avoided costs associated with a particular stormwater management option depends on how much stormwater is treated or diverted relative to the baseline, as well as the location attributes of the site and the impacts untreated stormwater can have on the environment it is released into. It isn’t always easy to calculate, but it is information that is needed in order to know the true benefits of a stormwater treatment system. Stay tuned for upcoming blog posts on the benefit of green infrastructure in stormwater treatment and the fiscal impacts of urban flooding. We at rbouvier consulting are very interested in ecosystem restoration, and in particular, methods that economists might use to measure the benefits of ecosystem restoration. This article presents an analysis of the benefits associated with managing and restoring the Great Dismal Swamp National Wildlife Refuge in Virginia (particular appropriate for a dismal scientist!). The GDS is a forested peatland. While there are those who might look at the swamp and appreciate it solely for its aesthetic appearance, a system such as the GDS can provide essential ecosystem services in terms of carbon sequestration. In fact, the authors find that actively managing and preserving the swamp can provide benefits to society of up to $524 million, above and beyond management costs. The authors use the social cost of carbon (link to blog post here) to monetize the benefits. 2. “Neither Boon nor Bane: The Economic Effects of a Landscape-Scale National Monument,” Land Economics, Volume 94, Number 3, August 2018, pp. 323-339, by Paul M. Jakus, Sherzod B. Akhundjanov. The designation of a national monument has been a source of controversy over the past several years. Proponents of national monuments point to the potential increase in tourism that such a designation can bring, whereas opponents point out the restrictions that are sometimes made (such as restrictions on hunting or ATV use). This article looks at the Grand Staircase–Escalante National Monument in Utah, and examines trends in economic activity both before designation and after designation. Their conclusion is that, at least in this case, designation as a national monument neither helped nor hindered the per capita income of the region. However, as the authors point out, economic efficiency is only one metric by which to measure the success of a national monument designation. It would be helpful to study other recently-designated national monuments to see if their results are transferable. 3. “Population health effects and health-related costs of extreme temperatures: Comprehensive evidence from Germany,” Journal of Environmental Economics and Management 91 (2018) 93–117 by Martin Karlsson and Nicolas R. Ziebarth. Given some of our current projects, we have been very interested in the local costs of climate change-related events. While this article was published in Germany, it nonetheless gives us an idea of the health related costs of extreme temperatures – and a possible methodology to follow. The article finds that extreme heat “significantly and immediately increases hospitalizations and deaths.” The effects decline over time, as one might imagine, but the economic impact include not just the cost of treatment, but lost productivity as well. An interesting methodological result is that their findings hold whether they use standard economic models or epidemiological models – good news for those doing their research in either field. We were also interested in this article, which investigated whether urban stream restoration projects affected nearby property values. We have done some work related to this in the past. The authors find positive effects on property values for properties located in close proximity to storm water, floodplain, and revegetation projects, but negative effects for wetland restoration projects. They identify two counter-vailing effects that could help to explain: a “benefit” effect, whereby the restored area conveys benefits onto nearby properties (such as storm water mitigation or flood reduction) and a “damaged goods” effect (wetland restoration can often necessitate large – temporary – aesthetic damage that might affect a property’s sale price). Vulnerability Assessements: What are they and do you need one? Vulnerability assessments are a hot topic in sustainability and climate adaptation circles these days. It is the process of looking at a system and trying to figure out what might make that system fail under particular circumstances so that you can begin to find ways to mitigate those possible failures. The system might be anything from a computer network, to a power grid, to a neighborhood. When it comes to climate adaptation the assessment generally looks at how a system, such as town, or piece of infrastructure, would be impacted by certain effects of climate change. It can be an indispensable tool in climate adaptation planning. What asset or system are you choosing to focus on? What are the climate stressors that will impact it? Who might be impacted by these climate stressors on this particular asset or system? What information do you not have that you might need to collect? What resources might you need to help complete your assessment? This may seem like a lot of information to come up with, but it may be a little less intimidating if we use an example, such as the main road through a medium sized town. What assets are we focusing on? The main road through our downtown. What are the climate stressors? The road floods more and more frequently due to a nearby river overflowing when large rainstorms and hurricanes come through the region. Who is impacted? People who live near or who have businesses in the downtown area. Emergency vehicles that need to have a fast route to those in need. People from other towns who travel through on their way to other places and those who come to town to do business. What information do you need to collect? The frequency of flooding and assessments of past damage. Perhaps a count of cars that travel the road. Documentation of alternate routes of travel should the road be flooded. A list of your possible actions for mitigation of the flooding, along with potential costs if you already have some in mind. Often people do not have solutions at this stage but will be using the assessment to determine what issue should be dealt with first. What resources might you need? Do you have the inhouse expertise, personnel, or time available to do the assessment? You may need to contract with a consultant or other experts to assist with the process. Other important questions include how to fund the assessment and what your timeframe is for completion. Keep all this information, the questions and your answers, handy. This is a roadmap for your assessment. You will need to refer to it as you move through the process. You may discover that you need to ask more questions, or you may find that something you felt was relevant no longer is. Collect. This is just what it sounds like. It is collecting the information and data you need to do the assessment. Some of the information might already have been collected by other people. Rainfall amounts, storm frequency, or weather history can often be provided by government agencies. But there are other items that may not be readily available. How many emergency call responses have been delayed by the road flooding? You may need to do a survey of residents to find out how many times they needed to find alternate travel routes. Or perhaps you need to set up equipment to count the number of cars that travel the roads. 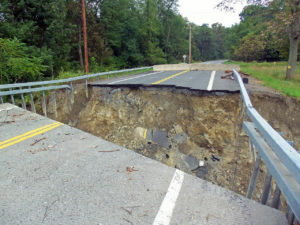 If you are collecting financial information on past damages you will need to know what your parameters are – are you counting just damage to the road itself, will you include losses to business, or the value of the extra travel time for residents who need to find alternate and possibly longer routes. Assess. Once you have collected the information you need, it is time to put that information to use. You will want to use this information to answer questions about which areas of the road are most vulnerable. Is there one area that is damaged more often than other parts of the road? Are there certain populations that are most vulnerable to the impacts? At this point you may also find that some of your assumptions were incorrect and there are other issues you were not aware of. Again, you may want some experts to assist you on this. Apply. Now you have your information, you’ve figured out which parts of the road are most at risk, how much future flooding could cost your town, and who is most affected by it. You can now use this information to prioritize your solutions. This might be determined by cost such as which repairs or mitigation techniques will prevent the costliest damage. Or you might base it on human need, giving emergency vehicle access priority. It might also be time based. Is there a part of the road that is most at risk right now? A vulnerability assessment is a vital tool when it comes to assessing the impacts of climate change and how to plan your adaptation strategies. But once it is done, don’t set the assessment aside. It will be a roadmap that you can refer to as you move forward. Once you have implemented your first solution you will need to review what to do next. You may also want to use it as a reference for future assessments as an accounting of what worked and what didn’t. It can continue to provide you with the information you need to best meet the changes and challenges that climate change will present in the future. [i] This four-step assessment process is based on the vulnerability assessment process as presented by the National Oceanic and Atmospheric Administration (NOAA) at the Adaptation Planning for Coastal Communities conference in Brunswick, Maine in the spring of 2018. This article focuses on aggregate indicators of the effects of climate change on total economic welfare and on the distribution of those welfare impacts. The author argues that while climate change may, initially, have “net positive” benefits in the aggregate, the impacts turn globally negative after a certain degree of warming is met. Moreover, the negative effects of climate change will fall disproportionately on developing nations: first, because of their exposure (less developed countries typically have a larger share of their economic activities directly related to environmental resources); second, because less developed countries tend, on the whole, to be located in hotter areas; and finally because less developed countries often lack access to medicines and technologies that could help temper the negative impacts. The latest issue of Environment and Development Economics is devoted to investigating the links between poverty and climate change. Switching gears slightly from the impacts of climate change to ways of potentially mitigating it, a recent article in the Journal of Environmental Economics and Management looked at “urban afforestation,” the idea of planting trees in urban areas. Urban afforestation, the authors claim, generate co-benefits in terms of public health and well-being. Using a tree planting program in New York City, the authors use an integrated bio-economic and health model to demonstrate that annual net benefits range from $10.24 to $12.10 per tree planted, even after accounting for costs and any ill health effects from pollen. These benefits arise from carbon sequestration, air pollution reduction, storm water reduction, and aesthetic effects. How do we measure economic success? GDP, the conventional measure of the success of an economy, doesn’t do a very good job of measuring economic welfare. To give just a few examples, GDP doesn’t include volunteer or household labor, doesn’t account for pollution, and is not adjusted for what might be called the “depreciation of natural capital.” The Genuine Progress Indicator, or GPI, was developed to address those short-comings. A recent article in the journal Ecological Economics presents the first 50-state estimate of the GPI in the United States. Interestingly, over 90% of the variation between the states can be explained by the depletion of non-renewable energy resources, personal consumption expenditure, and motor vehicle crashes. The article makes for very interesting reading.